Originating in the cooler northern regions of the Eastern Asia, the chrysanthemum responded quickly to the efforts of hybridizers when the first plants were introduced to Europe in the 8th century. Their attraction lies in four main characteristics; flowers may be obtained in various forms and sizes, in virtually every color other than blue; plants grow successfully over a wide area of the country, and are highly adaptable to soil, climate and treatment; by choosing suitable varieties, flowering can begin in the open garden in August and September, followed by the late-flowering types under glass from October to February. Perhaps the greatest attraction is the way the plant invites the grower’s cooperation and intervention throughout the whole growing season. The new grower should obtain his stock from a specialist nursery. In subsequent seasons it is possible to raise new stock from the stools of the previous year. A stool is what is left when the flowers have been cut and the main stem is shortened to about 12 in. Though in many areas the chrysanthemum is hardy, it is better to take up the stools, wash them free of soil and then box them up in fresh compost. Keep the soil fairly dry throughout the winter and house the stools in a cool greenhouse or protected cold frame. In early spring the stool will send up young shoots and once growth has begun, give sufficient water to keep the soil moist. Growth can be hastened by applying gentle bottom heat but temperatures should not rise far above 50°F ( 10°C). Propagation may now proceed by either of two methods. If the shoots have roots already developed they may be taken off and boxed up to make new plants. For various reasons, better plants are obtained by taking cuttings. Clean, healthy young shoots some 2-in. long should be cut or broken off and inserted 1-in. deep in a flat or bed of standard compost. A thorough watering is then given and the container placed in a simple frame covered with light cloth to shade the shoots from bright sunlight and to keep the air around them humid. This simple propagator may be placed either on the greenhouse bench or inside a cold frame. Since the optimum temperature for rooting is around 55°F (13°C) some slight warmth, particularly in the form of bottom heat, will help matters greatly. If rooting hormones are used, well rooted plants should be produced in a month. Most early flowering varieties root easily in March and April but those which bloom during the later months in the greenhouse require an earlier start in January and February. The young plants must be gradually prepared to face the outside conditions. Earlies are grown either in flats or in a bed of soil on the floor of the cold frame. Whichever method is used, they should be given plenty of room to develop and nothing less than 4-in. spacing will do. Since late flowering plants are usually flowered in pots it is as well to start them in 3-in. pots, using a general compost, or a soilless compost. As the pots fill with roots it will be necessary to move the plants to 5 or 6-in. pots. A final potting will be needed later on into 8 or 9-in. pots using a compost consisting of 3 parts loam, 1 part peatmoss, 1part sand, 1 part rotted cow manure plus 1 pint bone meal and 1 pint hydrated lime per bushel of mix and a small amount of charcoal. Make the compost little more than finger firm so as to encourage rapid root extension. You could also buy Sunshine potting soil mix. Late varieties can also be grown in the open garden and the plants lifted and replanted in the greenhouse in late September for flowering; the plants should be treated exactly as advised for the early flowering varieties. While plants are in the frame, guard against over watering, frost and drafts. Gradually increase ventilation so that plants are hardened off by late April. Ideally the soil should be well drained yet retentive of moisture; fertile without being over-rich and open to all the light and air available. A liberal dressing of manure or other humus forming material should be dug in during the fall and the surface left rough. About mid-April a dressing of 4 oz. per square yard of a balanced fertilizer should be tilled in to a depth of a few inches only, leaving the main body of the soil undisturbed. Raking to produce a good tilth is best left until a day or two before planting in May, the actual date depending on weather conditions. The canes should first be inserted and the plants placed close to them, each one secured by a loose tie and protected from slug damage by the application of bait. Late-flowering plants in pots are moved out to their summer quarters at the same time. Insert a cane in each pot and set out the pots in lines, securing the canes to a wire stretched about 4 ft. above the ground. Leave at least 1 ft. between the pots and 2 ft. between rows to allow free access. Plants may also spend the summer in the greenhouse. To obtain the best results it is helpful to understand the way in which a chrysanthemum plant develops. It begins with a single stem which extends until a flower bud appears in the growing point. This normally happens so early in the season that the bud fails to develop into a flower but forces the plant to break into lateral growth thus forming a bushy habit. This bud is known as the break bud. In their turn, the laterals extend and in due time form buds. According to the time of year, either a cluster of buds or one bud surrounded by leafy shoots will be produced. Such buds are known as first crown buds. Where leafy shoots are produced around this bud, they will grow on strongly and produce further buds known as second crown buds and if the grower does not intervene the result is a large first crown flower struggling into bloom at the base of a cluster of much smaller flowers, a rather unattractive effect. when the laterals arising from that first pinch are to be stopped again by the removal of the growing points. The result will be a further crop of side shoots which are allowed to produce their buds to be dealt with as before by the removal of all buds except the central one. Two pinches will give far more stems than one but resist the temptation to flower them all. To obtain flowers of good size and quality the limit should be set at six to eight. Sprays and pompon types are exceptions. These branch naturally and all you need to do is to encourage the development of laterals by one pinch only, when the plants are 9-12 in. high. Since the beauty of these plants is in the large number of small starry blooms carried in sprays, no disbudding need to be done. Nevertheless it may be wise to restrict the number of stems to ensure larger flowers. By late May all plants will be growing away nicely in pots or the open garden and within some seven weeks the earlies will have to develop into mature bushes of up to eight stems each bearing its flower bud. Well prepared, fertile ground will give fair results without further help but it is usually beneficial to give some added feed, firstly at the beginning of June to encourage quick establishment; secondly at the end of June to ensure that the plants are in vigorous health at the time the flower buds are being formed. Each time an application of a chrysanthemum fertilizer in powder or liquid form, is all that is required. Where late flowering plants are grown in pots, feeding is more important. Liquid feeds are by far the best. It doesn’t really matter what the label says so long as the relationship between the nitrogen and potash content is correct for the particular purpose. During the rapid development of leaf and stem there should be roughly twice as much nitrogen as potash. As the buds appear and are being dealt with, give only clear water but start feeding again when the buds have begun to swell, but now the nitrogen and potash contents must be roughly the same. Do not give heavy doses every ten days or so but give about a quarter the recommended strength every time you water. Correct use of the watering can is crucial to good growing but it is something which has to be learned rather than taught. With pots the safest rule is to apply water just before the plant threatens to wilt. Both the leaves and the soil surface will give clear indication when that point has been reached and enough water should be applied to moisten thoroughly the whole soil ball. Throughout the period of rapid growth it is necessary to control the plants. Remove surplus branches and shoots as soon as they are seen; tie flowering stems loosely to the cane every 9 in. or so. Never tie too tightly but, to avoid breakages, allow branches to sway a little in the breeze. Watch out for and deal with early pest infestations; the best insurance against pest damage is to keep the garden free of weeds. Late flowering types are flowered under glass. In late September, when the buds are beginning to show the first signs of color, it is time to house the plants that have been outside for the summer. Remove all old leaves to about one third of the height from the pot, remove all surplus growths; tie up the plants securely and place extra canes if necessary. Spray with an insecticide and with a systemic fungicide to combat mildews. The greenhouse must be thoroughly cleaned. Remove all debris and any growing plants before burning a sulfur candle. When the fumes have dispersed, wash the glass and every crevice with a jet of water from the hose. Test the heating apparatus and seal every leak in the roof. Ideally there should be plenty of space around the plants inside but in practice one tends to pack them in rather tightly. In fact, it is far better to leave a few poor prospects outside so as to give the better plants more light and air. For the first ten days or so, leave doors and ventilators fully open. Watering will rarely be required for several days but it is good practice to give a little water say every two days rather than to wait until a pot is bone dry. In this latter condition the water will run all over the floor and cause damp air —the worst enemy of flowers indoors. After this the ventilators should be used in conjunction with the heating apparatus to main a dry moving atmosphere at a night temperature of around 50°F (10°C). Light shading may be helpful in bright weather. This is not only the season of satisfaction and enjoyment, it also provides opportunity for planning future efforts. Look critically at the plants and their flowers with a view to choosing those which have exhibited both vigor and excellence. These should be clearly marked so that they can be retained for the propagation of new stock. In this way the collection can be kept at a high level of health. There is much to be gained by visiting the local shows so as to see what is new and to chat with fellow enthusiasts. Chrysanthemum blooms will last longer if they are cut in the morning when the stems are full of sap. Place each stem in water immediately. Back at the house, bruise the lowest few inches of stem and remove all the leaves except the three or four beneath the bloom. Now set the stems in a deep container of water and place it in a dark, cool place such as a garage or outhouse, for about 24 hours. After this treatment the flowers will last for several weeks, particularly if any stems which are further shortened are again bruised at the base. Outdoor plants need not be cut right down at flowering time; in a mild fall, it is not unusual to have a second crop of delightful sprays. Blooms may be small but the enriched color and profusion of the flowers will more than compensate for lack of size. Neither early nor late flowering types should be cut right down after flowering. It is better to allow the sap to run back for a few weeks before shortening the main stem to about 12-18 in. In this state the stools can be boxed as described earlier. A final shortening to a few inches can be carried out in the spring. 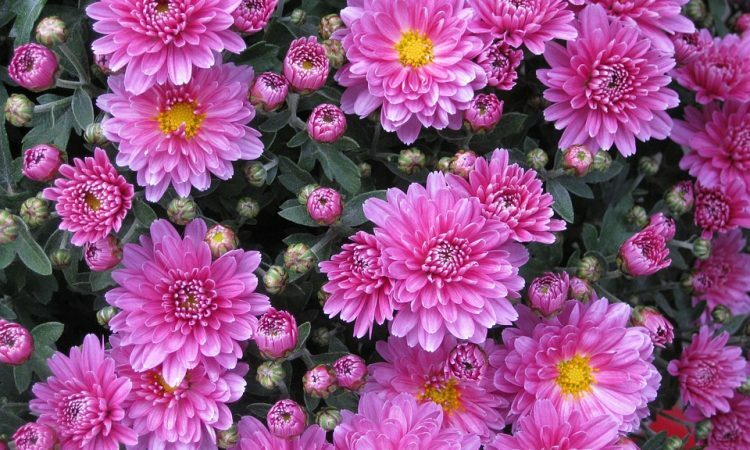 The selection of chrysanthemum varieties is extremely wide and numerous novelties are introduced each year. There are many other lovely cultivars but those listed can be relied upon to give the least trouble and the greatest satisfaction. Outdoor types which respond to disbudding to give blooms of fine quality for cutting or may be allowed to carry large crops for border work. Outdoor types requiring no disbudding. They produce a profusion of flowers in sprays which are excellent for vases. Low growing types suitable for the front of a border but not giving stems long enough for cutting. Late flowering varieties suitable for greenhouse decoration and cutting. The first mentioned in each color group will flower in October and may bloom happily in a cold greenhouse. The other will need slight warmth in late October and November. Late flowering varieties bearing flowers like large daisies. There not mentioned NPK ratio and other micro nutrients which is very essential.